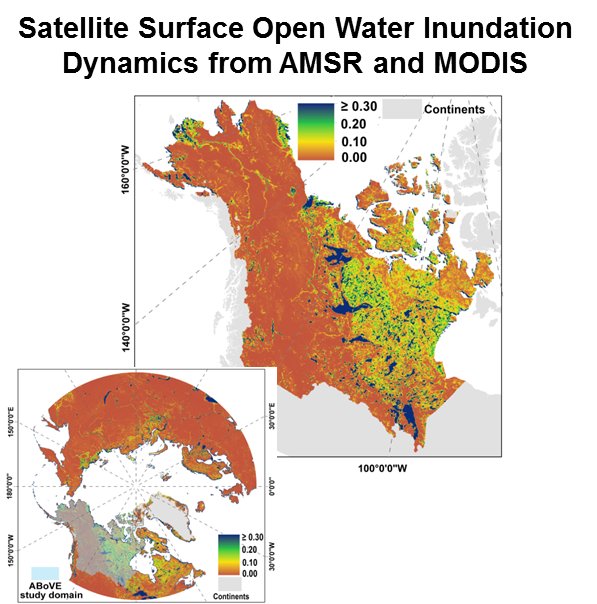 We are using a satellite data driven carbon model framework to quantify and improve understanding of the net ecosystem carbon budget (NECB) in boreal and arctic regions as part of the NASA ABoVE campaigns occurring over Alaska and Northwest Canada. 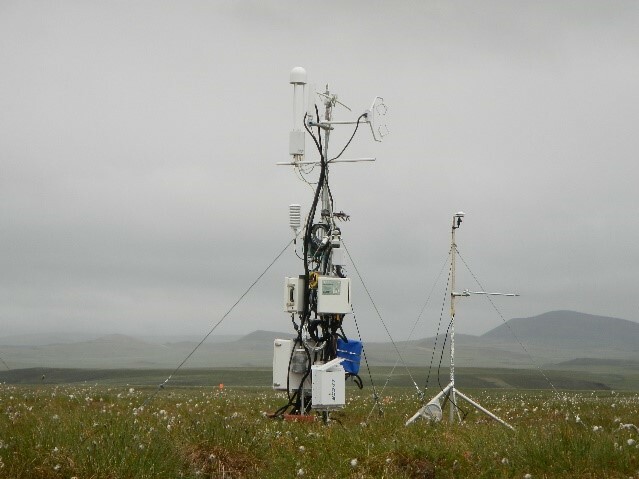 We’re investigating links between changing land surface conditions, including freeze-thaw regimes, snow cover, soil moisture and open water inundation dynamics influencing land-atmosphere carbon (CO2 and CH4) fluxes in permafrost landscapes. Detailed field measurements are being used with airborne and satellite remote sensing observations to clarify surface moisture and thermal constraints to vegetation growth and soil carbon cycling. Remote sensing data provide primary inputs to a terrestrial carbon flux (TCF) model used to quantify the NECB, component carbon fluxes and underlying environmental drivers over a 14+ year (2003-2016) satellite record. This study addresses several ABoVE science questions, including: “How are the magnitudes, fates, and land-atmosphere exchanges of carbon pools responding to environmental change, and what are the biogeochemical mechanisms driving these changes?” This study also addresses objectives for “elucidating how climate change and disturbances interact and alter land-atmosphere carbon exchange. Du, J., J.S. Kimball, L.A. Jones, and J.D. Watts, 2016. Implementation of satellite based fractional water cover indices in the pan-Arctic region using AMSR-E and MODIS. Remote Sensing of Environment 184, 469-481. Watts, J.D., J.S. Kimball, A. Bartsch, and K.C. McDonald, 2014. Surface water inundation in the boreal-Arctic: potential impacts on regional methane emissions. Environmental Research Letters, 9, 075001. Watts, J.D., J.S. Kimball, F.-J. W. Parmentier, T. Sachs, J. Rinne, D. Zona, W. Oechel, T. Tagesson, M. Jackowicz-Korczyński, and M. Aurela, 2014. 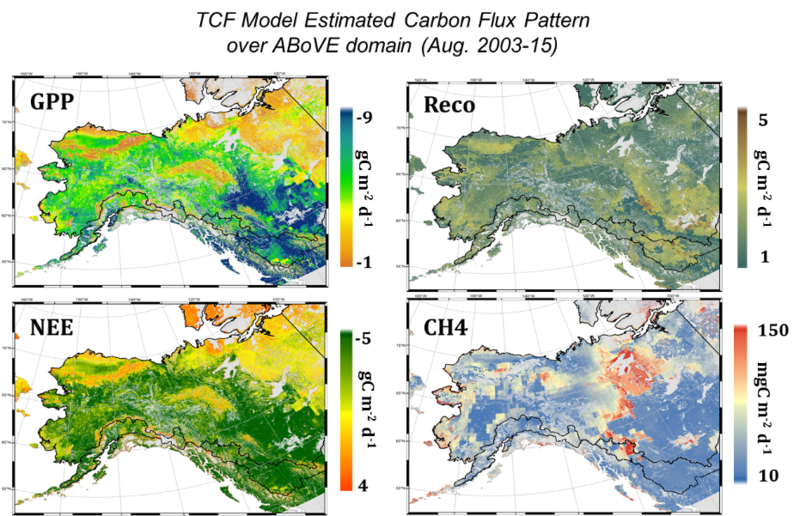 A satellite data driven biophysical modeling approach for estimating northern peatland and tundra CO2 and CH4 fluxes. Biogeosciences, 11, 1961-1980. Yi, Y., J.S. Kimball, R. Chen, M. Moghaddam, R.H. Reichle, U. Mishra, D. Zona, and W.C. Oechel, 2018. Characterizing permafrost soil active layer dynamics and sensitivity to landscape spatial heterogeneity in Alaska, The Cryosphere 12, 145-161. Yi, Y., J.S. Kimball, and R.H. Reichle, 2014. Spring hydrology determines summer net carbon uptake in northern ecosystems. Environmental Research Letters 9, 064003. Zona, D., B. Gioli, R. Commane, et al., 2016. Cold season emissions dominate the Arctic tundra methane budget. PNAS, 113, 1, 40-45.